Catalytic converters for cleaning exhaust emissions are more efficient when they use nanoparticles with many edges. This is one of the findings of a study carried out at DESY's X-ray source PETRA III. 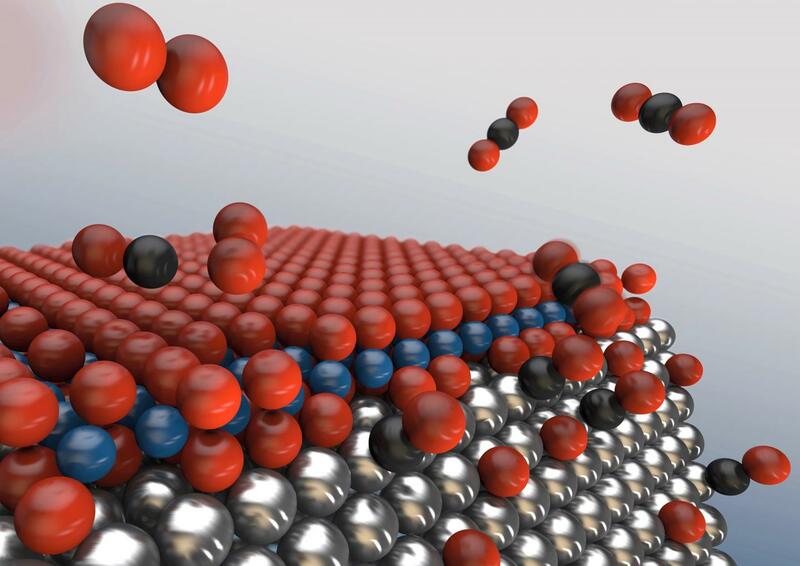 A team of scientists from the DESY NanoLab watched live as noxious carbon monoxide was converted into common carbon dioxide on the surface of noble metal nanoparticles like those used in catalytic converters of cars. The scientists are presenting their findings in the journal Physical Review Letters. Their results suggest that having a large number of edges increases the efficiency of catalytic reactions, as the different facets of the nanoparticles are often covered by growing islands of a nano oxide, finally rendering these facets inactive. At the edges, the oxide islands cannot connect, leaving active sites for the catalytic reaction. Catalytic converters usually use nanoparticles because these have a far greater surface area for a given amount of the material, on which the catalytic reaction can take place. For the study presented here, the scientists at DESY's NanoLab grew platinum-rhodium nanoparticles on a substrate in such a way that virtually all the particles were aligned in the same direction and had the same shape of truncated octahedrons (octahedrons resemble double pyramids). The scientists then studied the catalytic properties of this sample under the typical working conditions of an automotive catalytic converter, with different gaseous compositions in a reaction chamber that was exposed to intense X-rays from PETRA III on the P09 beamline. The efficiency of catalytic materials can be measured using a mass spectrometer that reveals the proportions of certain types of molecules in the exhaust emissions, here the relative concentrations of carbon monoxide, oxygen and carbon dioxide. "We carry out a kind of emission test on the nanoparticles," explains Uta Hejral, the first author of the paper, now working at Lund University in Sweden. Because of the parallel alignment of the nanoparticles, the scientists were also able to determine those surfaces of the nanoparticles on which the reaction went particularly well. "Here we can really follow the reaction on an atomic scale," Hejral points out. Normally, the noble metal nanoparticles in a car's catalytic converter are attached to tiny crumbs of substrate, which stick together forming complex structures. "These are difficult to examine using X-rays, because the noble metals only account for a few weight percent and in particular because the nanoparticles are aligned in all sorts of different directions," explains Andreas Stierle, who is a lead scientist at DESY and a professor of nanoscience at the University of Hamburg. "Under X-ray illumination, every particle produces a separate diffraction pattern and these overlap to create a blurred image. By having them aligned in parallel to each other, on the other hand, the diffraction patterns of all the nanoparticles are superimposed and amplify each another. This allows the different facets of the nanoparticles, in other words their individual surfaces, to be identified and specifically observed." The investigation showed that the reactivity of the nanoparticles increases sharply at a certain oxygen concentration. "This happens when just enough oxygen is available to oxidise each carbon monoxide molecule and turn it into carbon dioxide," says Stierle. Beyond that concentration, the reactivity gradually drops again because a thick oxide layer grows on the surface of the particles, impeding the reaction. The X-ray analysis reveals the atomic structure of the surface of the nanoparticles at the best resolution yet under the conditions at which the reaction occurs. This shows that once a certain oxygen concentration is exceeded, the different crystal faces of the nanoparticles become coated with an oxygen-rhodium-oxygen sandwich, until eventually the surface of the metal is completely covered by this nano oxide layer. "The surface oxide eventually forms a closed layer over the nanoparticles," reports Hejral. "This is unfavourable for the desired reaction at first, because it makes it difficult for carbon monoxide molecules to attach themselves to the surface. However, the oxygen is unable to form a closed film along the edges between the faces of the nanoparticles, which means that the reactivity along the edges is higher." This finding suggests a direct pathway to making catalytic converters more efficient: "We would expect catalytic converters to be increasingly efficient the more edges the nanoparticles have for a given surface area," says Stierle. This finding can probably also be applied to many other catalytic reactions. Additional studies will have to show by how much the efficiency can be increased as a result.